Photos 24 mp (6912 x 3456). Supports RAW format. Video resolution - 3840 x 1920, 30fps or 2560 x 1280 @ 60fps. Supports LOG format. Live streaming resolution - up to 4K 3840 x 1920. Works with YouTube, Facebook, Periscope / Twitter, Weibo. First time they will have demo at IFA Exhibition. Insta360 launched the ONE, a versatile 4K 360 camera that represents a breakthrough for both immersive storytelling and for the way that we capture and share traditional framed video. The Insta360 ONE shoots 360 video and photos at resolutions of 4K (38401920@30fps, 25601280@60fps) and 24 MP (6912 x 3456), respectively. 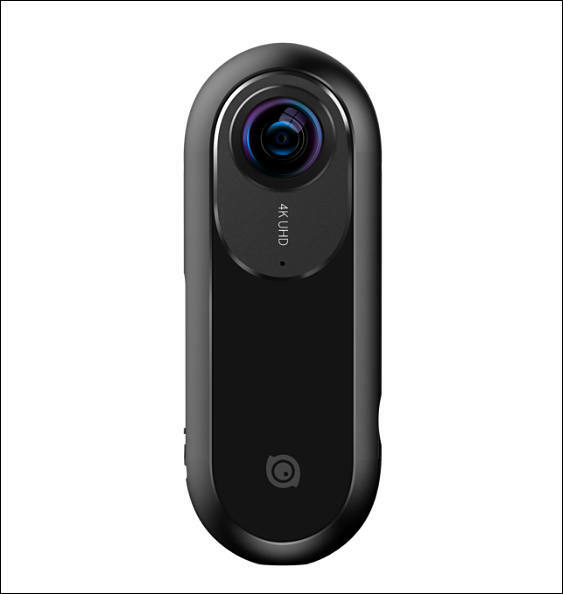 It significantly advances Insta360’s signature adaptability and convenience, offering three modes of operation: standalone use, remote control via Bluetooth, and control via a direct connection to a smartphone’s charging port. The iPhone-compatible version is available now, with an Android version on the way. The Insta360 ONE introduces groundbreaking FreeCapture technology. Using FreeCapture, users can effortlessly hone in on the key moments of a spherical video, translating the original 360 footage into a standard 1080p fixed-frame video that’s ready to share anywhere – all from their smartphone. The process to create a FreeCapture video on the ONE is as innovative as it is intuitive. First, users hit record and effortlessly lock in every detail of an experience, as though they had a multi-cam setup covering every angle of the scene. Then, when they’re done filming, they simply connect the ONE to their phone and offload the experience. This is where FreeCapture works its magic. 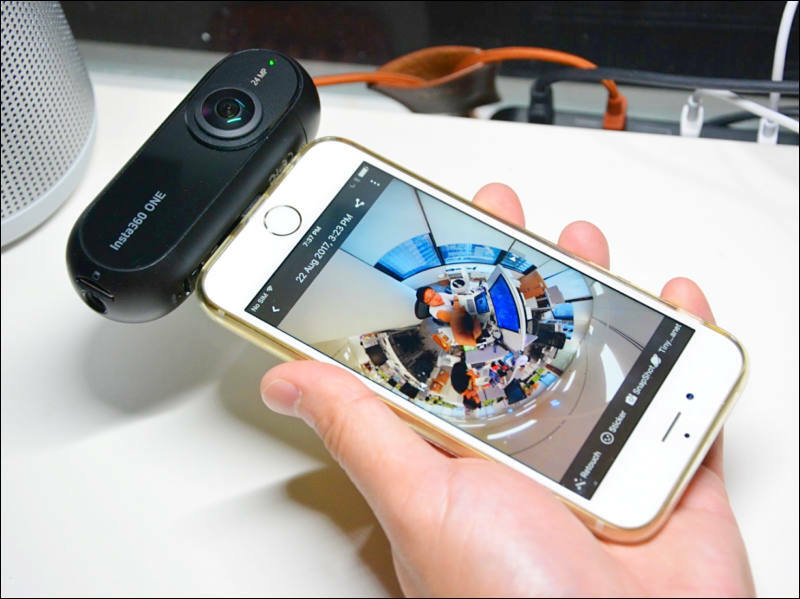 Leveraging a phone’s onboard gyroscope, FreeCapture lets users simply peer into the original 360 scene using their phone display as a viewfinder. Whatever they see as they point their phone into the original experience is what they’ll capture in a fixed-frame video. In other words, users can stand in the present moment while they film a past experience – using exactly the same hand motions they would always use to capture a video on their phone. Never before has this editing technique been achievable on a phone, and it opens the door on a new era in videography, allowing anybody – from a journalist to an outdoor adventurer – to effectively act as their own camera crew. FreeCapture also allows users to seamlessly shift from standard perspectives to the unique shots that are only possible with 360 cameras, such as “tiny planet” and “rabbit hole” effects. 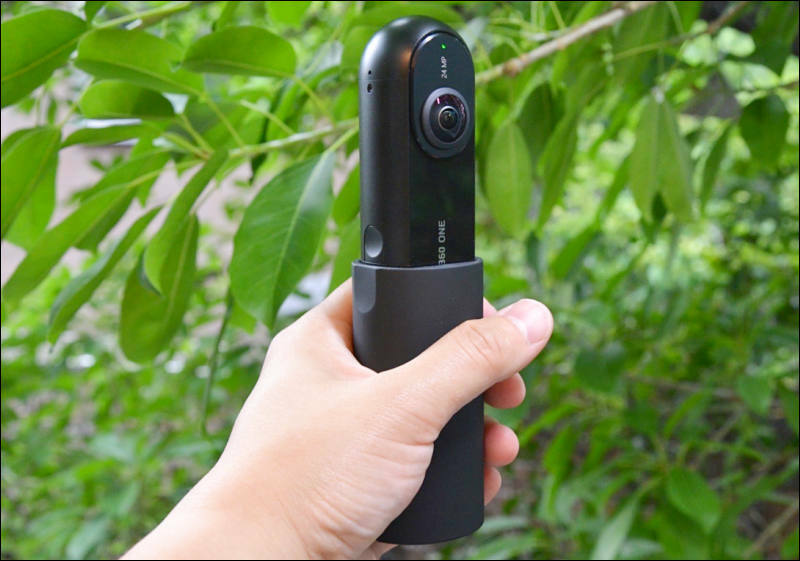 While maintaining the mobile-friendliness of all of Insta360’s products, the ONE adds a range of new features that makes it the premiere standalone 360 camera for consumers. The ONE achieves six-axis image stabilization with an onboard gyroscope, ensuring that it records smooth video without sacrificing quality – even in rough-and-tumble situations. Advanced stabilization is also what makes possible the all-new bullet time mode, which has to be seen to be fully appreciated. Using only a selfie stick or a string attachment, creators can capture up to 240 FPS slow-motion shots where the ONE circles them dramatically, always keeping them center-frame—while the accessory used to spin the camera is flawlessly concealed. (The ONE shoots at a maximum of 120 FPS, while 240 FPS video is achieved algorithmically with the companion app.) Epic shots such as those innovated by the Wachowskis and Swiss skier Nicolas Vuignier can for the first time be captured by anyone, with no hassle. The new SmartTrack feature lets users automatically capture a 1080p fixed-frame video where the subject of their choice is always centered. It means users can first capture everything, and then let the ONE give them a ready-to-share, classic-sized video that keeps the spotlight on their key subject. After attaching the ONE to a selfie stick, the stick will be automatically erased from the footage. Once the stick’s out of the picture, the ONE works like a flying camera – capturing stunning 360 views from an overhead angle. 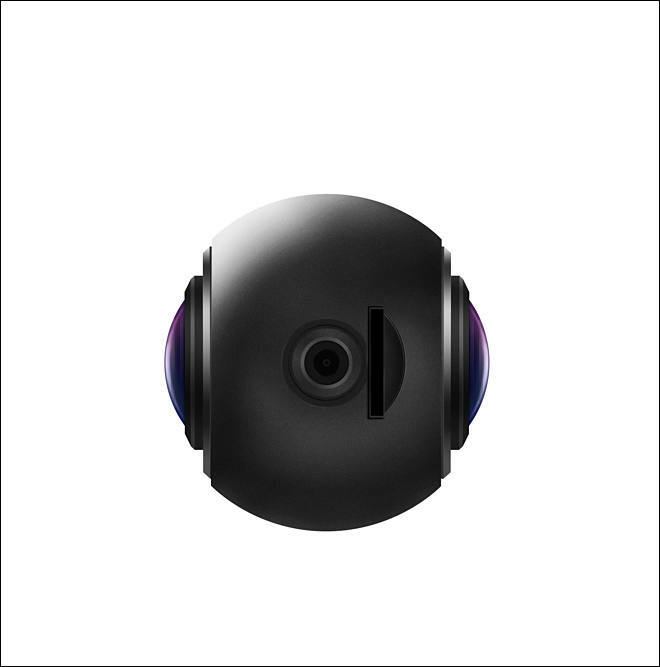 With its compact form and a built-in socket for standard 1/4“-20 screws, the ONE is Insta360’s most versatile camera ever. It can be instantly mounted on helmets, drones, cars, tripods and a wide range of other tools and accessories. The ONE’s IP68 waterproof housing (sold separately) is effective at up to 30-meter (98.4 feet) depths and makes it ideal for filming watersports and underwater scenes. A purpose-built selfie stick and Bluetooth remote control will also be available for purchase to let users easily achieve the bullet-time effect and other “flying camera” shots, while an included string attachment will make the effect achievable straight out of the box. The ONE offers an HDR (high dynamic range) shooting mode and supports taking pictures in RAW format and videos in Log format, allowing for convenient, precise post production. 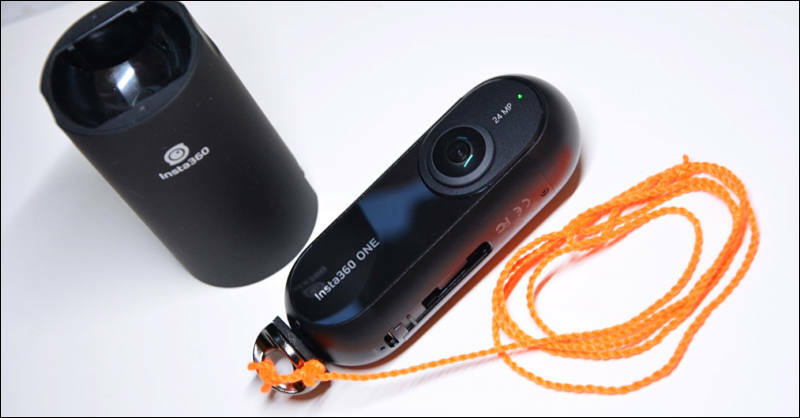 It also shoots time-lapse 360 video, and its full-featured camera settings offer manual control of exposure value, ISO, shutter speed, white balance and more. To find out more, please visit: https://www.insta360.com/product/insta360-one/. The Insta360 ONE is available now at https://mall.insta360.com/ and via authorized dealers such as Amazon and B&H. Shipments will start September 5. The US retail price of an Insta360 ONE – including a camera, a two-in-one case and camera stand, a MicroSD card, a Micro-USB cable, a lens cloth, and a string attachment to achieve the bullet-time effect – is USD $299.90. Los Angeles, December 6, 2017 – Insta360 today launched the Insta360 ONE Android Adapter, bringing state-of-the-art 360° photo, video and live-streaming to users of the world’s most popular mobile operating system. Since its launch, the Insta360 ONE has cemented its status as the most versatile 360° camera in the world. 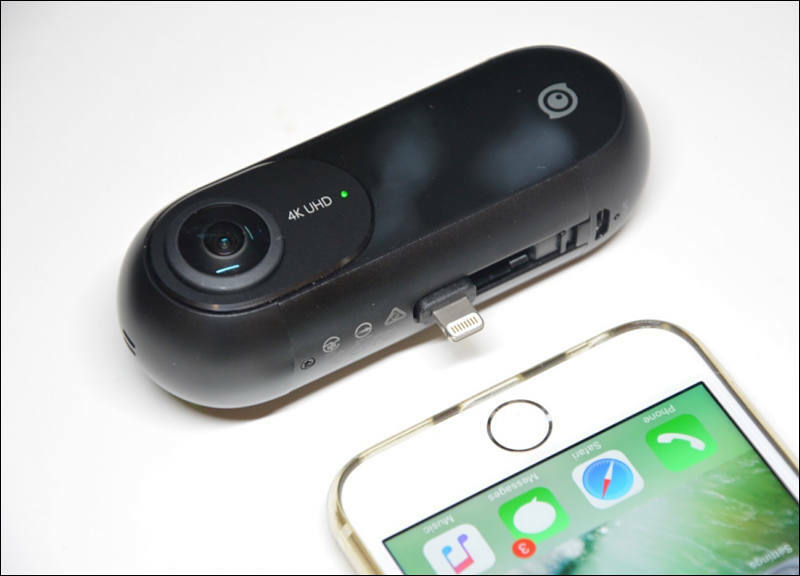 Now, using a simple adapter that snaps into a phone’s charging port, Android users can connect the ONE to their phone and begin capturing, editing and sharing 360° content. The Insta360 ONE Android Adapter brings all of the ONE’s unique features to Android – from FreeCapture editing and seamless social sharing, to the camera’s signature bullet-time mode. With both a USB Type-C and Micro-USB version, the Insta360 ONE Android Adapter is available now on the Insta360 Store https://store.insta360.com/. The adapter can be purchased on its own for $29.00 USD, or together with the Insta360 ONE at a limited-time sale price of $298.00 USD. Los Angeles, March 20 - Innovative camera maker Insta360 today announced a major update for its popular Insta360 ONE, adding a groundbreaking stabilization technology and smart editing features that put the camera at the forefront of a new type of photography – using 360-degree camera technology to improve the way we create traditional, “flat” video and photos. The new features are part of the latest version of the Insta360 ONE app, available at https://itunes.apple.com/us/app/insta360-one/id1239300711 later this week. The first step to creating compelling content from a 360-degree video is to be sure that the original video is as smooth and stable as possible. 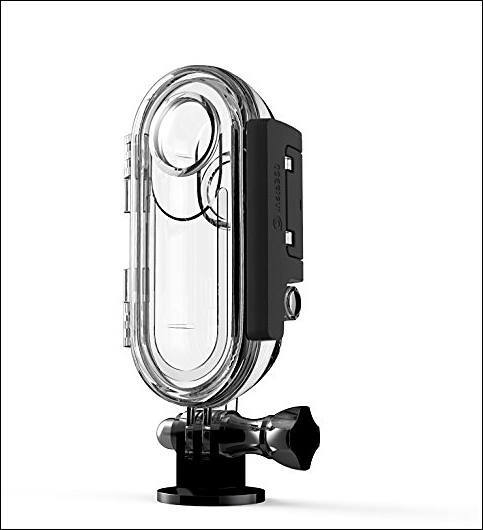 That’s why the updated Insta360 ONE introduces all-new FlowState stabilization, a proprietary stabilization technology that captures hypnotically smooth video. Comparisons show that a ONE using FlowState stabilization produces smoother video than a leading smartphone mounted on a gimbal. Meanwhile, the fact that FlowState is native to the ONE, with no accessories required, vastly expands its range of use – allowing users to directly mount the ONE on vehicles, selfie sticks and drones, while still ensuring a stable result. The updated Insta360 ONE also introduces new tools to quickly and simply edit together the best parts of 360 videos, and to take full advantage of the new creative possibilities they open up. When editing a 360 video in the Insta360 ONE app, users will have three choices of how to re-capture the key moments. New Pivot Points allow users to set points of interest throughout a video, giving an outline of the story they’d like to tell. Once set, the app automatically connects the points using ultra-smooth camera movements. It’s a fast, simple way to create professional-quality edits that would otherwise take hours on a desktop running specialized post-production software – not to mention multiple cameras covering different angles of a scene to begin with. The newly improved SmartTrack lets a user select a key object or feature within the scene, then automatically holds it in center-frame throughout the video. The extra space for cropping offered by the 360° field of view, combined with proprietary FlowState stabilization, creates strikingly smooth tracking shots, all with a single tap. ViewFinder mode gives total manual control. A user can maneuver their phone exactly as they would if they were recording an experience in real-time with their smartphone camera – turning from side to side, and adjusting zoom on the fly. Whatever they capture in their “re-shoot” will be saved as a new video. The possibilities are literally infinite. The ONE’s upgraded stabilization also makes creating stunning hyperlapses (that is, a time-lapse where the camera itself is moving from one place to another) easier than ever. Rather than painstakingly shooting every frame of a hyperlapse with a DSLR, or using a stabilizing accessory, ONE users can simply run and gun. FlowState stabilization will take care of creating a video that’s stable enough to be hyper-lapsed, and the app will take care of the rest. Even better, creators will have a 360 video as the raw material for their hyperlapse, allowing them to freely guide the viewer’s perspective in any direction as the camera moves through time and space. The app Insta360 ONE users can take advantage of all of today’s updates by downloading the latest app here when it goes online later this week and following prompts to install the latest firmware.